Who says you have to give up your insatiable need for comfort food just because you want to eat better for yourself, animals and the planet? 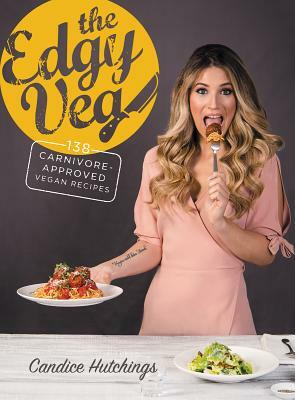 Enter: The Edgy Veg, the YouTube sensation (with over 220,000+ subscribers and counting) created by the hilarious Candice Hutchings and her husband James Aita who are on a journey to revolutionize vegan food as we know it. Tired of a traditional plant-based diet that just felt frankly #sad, Candice started veganizing childhood cravings, fast food faves and food-nerd obsessions. Think more UnOrthodox Lox and Cream Cheese Bagels, Cobb Your Enthusiasm Salad, Buffalo Cauliflower Wings 7 Ways, Easy Cheesy Fondue, Chick Fillet Deluxe and Thank You Very Matcha Ice Cream than zucchini noodles, hummus, smoothie bowls and #cleaneating (fear not, there is a token kale salad.) No food is off limits and everything in the book has received their signature carnivore stamp of approval. Candice Hutchings is the host of The Edgy Veg YouTube channel (250,000 + subscribers and counting) and blog which she co-founded with her husband James Aita. The couple live in Toronto, Ontario, with their two dogs, Sir Winston Churchill and Harley Quinn (@vedgydogs).